PLEASE NOTE BETWEEN MONDAY 30 JULY AND SATURDAY 1 SEPTEMBER 2018, TELEPHONE BOX OFFICE OPENING HOURS WILL BE 10AM - 5PM MONDAY TO SATURDAY. When available, Concessions apply to children, full-time students, and persons of State Pension Age (find yours at gov.uk). If you have a disability you are entitled to receive 50% discount off full price seats. Should you need the service of a companion, their ticket is also half price. Proof of eligibility will be required. Patrons must state discounts and produce proof of eligibility at the time of booking, as discounts cannot be applied retrospectively. Book Online: Customers booking online are able to choose their seats. If this will be the first time you have used the on-line booking system, we recommend you set up your account before proceeding to buy tickets or choose seats. Simply click on MY ACCOUNT from the homepage to get started. We will send a confirmation of your password to your email address and you will then be able to book your seats. In Person: We are open Monday to Saturday from 10am until 15 minutes after commencement of the last screening. Sunday's we are open from 11am until 15 minutes after commencement of the last screening. By Phone: Call the Box Office on 01743 281281 between 10am - 7pm, Monday to Saturday, for instantly confirmed credit card bookings. Visa / Mastercard /Maestro / Delta accepted. Tickets will be sent out by 2nd class post for a charge of £1.50. Tickets purchased for screenings less than seven days away will be retained at Box Office for collection. 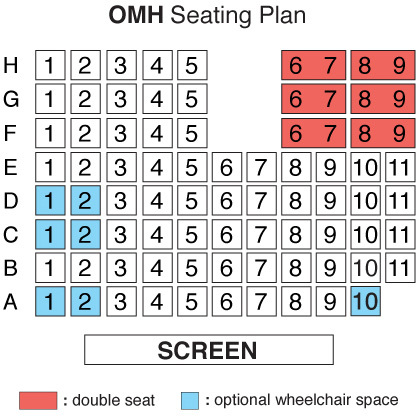 Click here to view seating plan. Tickets cannot be exchanged or money refunded except in the case of a cancelled performance.